Rumors were spreading around yesterday of a possible announcement today from Tesla to bring back a refreshed version of the Model S 60 kWh. The new Model S 60 is now available in the design studio, replacing the previous Model S 70 and reducing the range by 24 miles and the price by $5,000. The new Model S 60 has a 210 miles (400 km NEDC) of range, 130 mph of top speed and can do 0-60 mph in 5.5 seconds(5.2 seconds for the 60D). The rear wheel drive version costs $66,000, opting for all wheel drive will set you back another $5,000. 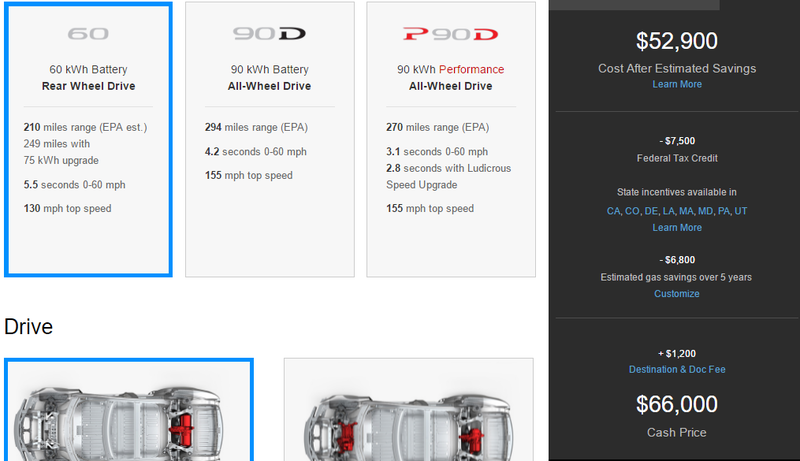 All Model S 60 kWh will come with a standard 75 kWh battery capacity which you can unlock via software update for $8,5000 (or $9,000 + $500 service fee after delivery), this increases the range by 19 percent to around 249 miles or 480 km NEDC and will grant you a new badge applied to your car at the next service appointment. This feature was already available for those who purchased the Model S 70 and were able to upgrade to the bigger capacity for $3,000. The original Model S 60 was priced from $70,000 when it came out in 2012 and replaced by Model S 70 in 2015. Elon Musk and JB Straubel repeatedly indicated the main objective of Tesla is to bring electric mobility to the masses at an affordable cost. While Model S and X are considered high class vehicles with the latest technologies available at Tesla, the company has been reducing their costs at a yearly basis while adding more features. 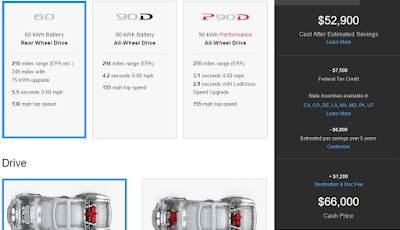 You can read Tesla's press release of the new Model S 60 below. "As you know, Model S is designed to be a great car for every lifestyle, and we continue to make it even better. Last month we introduced design updates to Model S, and through continual software updates we've made Model S faster, smarter, safer and more enjoyable to drive. It's part of Tesla's relentless commitment to making its products better. With these improvements, we've heard from a number of people who would like to buy a Model S, but can more easily afford it only at a lower price point. To respond to these requests, on Thursday June 9 we're introducing two new variants of Model S – Model S 60 and 60D, offering a compelling feature set and a great value at a new low price. The new Model S 60 delivers more than 200 miles of range, a top speed of 130 mph and zero-to-60 acceleration in 5.5 seconds, starting at $66,000. The all-wheel drive option brings even more range and performance, beginning at $71,000. And every Tesla comes equipped with active safety features and Autopilot hardware. Keep in mind that when comparing the price of any electric vehicle to an internal combustion vehicle, it's important to compare not just the out-of-pocket price, but also the effective cost of ownership. Factoring in annual fuel savings which typically ranges between $1,000 and $1,500, as well as available tax incentives, the effective cost of owning Model S 60 comes to about $50k. Less maintenance – Tesla vehicles don't require regular maintenance like oil changes, fuel filters or smog checks. And our four-year/50,000 mile bumper to bumper warranty and eight-year/infinite mile battery and drive unit warranty come standard with Model S.
Ample charging options – for most Tesla owners, home charging provides plenty of range for daily travel, and with anEPA range of over 200 miles, that's still the case for Model S 60 and 60D. For long distance travel, there are many convenient Supercharger and Destination Charging locations throughout our network. New features via free software updates – as with every Model S, the 60 and 60D will receive free over-the-air software updates that add functionality and continue to improve the driving experience for years to come. To provide customers even more flexibility over time, Model S 60 and 60D owners may later choose to upgrade their vehicles to a 75kWh battery with a software update, should they want to add to their car's battery capacity in the future."